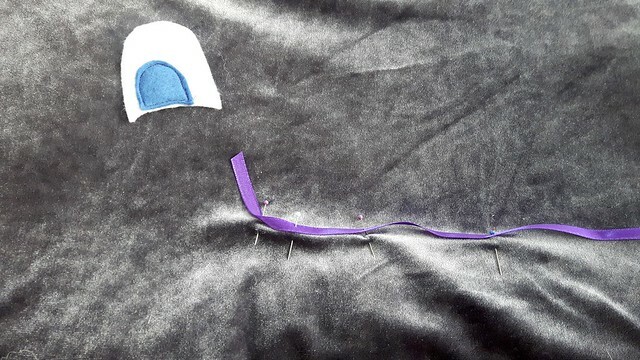 Let it be known here that I hate sewing and I’m really, REALLY bad at it. 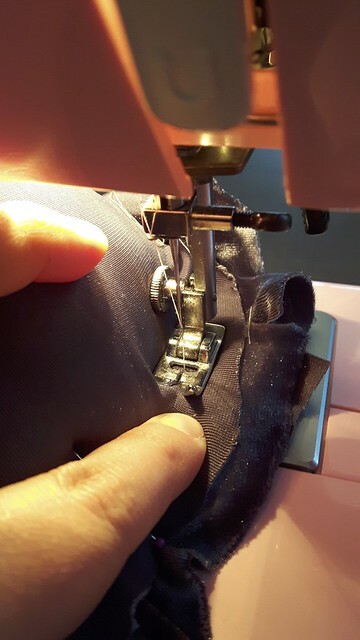 One hundred percent of my sewing projects here at Ali Does It could be done one hundred percent better than they are. 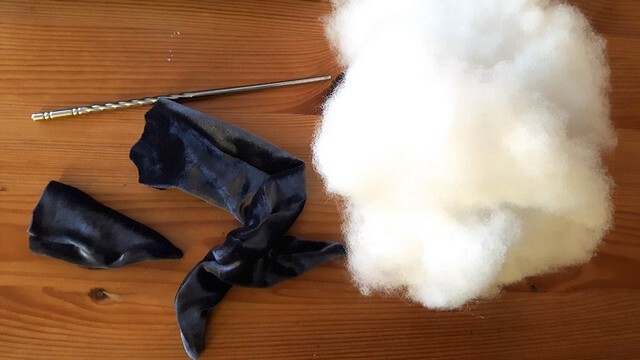 But I don’t have the patience or desire to do a better job, nor do I have the money to purchase these sorts of finished projects instead of doing them myself. I’m hoping that rather than being a direct how-to for all y’all out there in the hinternets, these sorts of half-assed half-assery will be more inspiration than instruction. That said, I can still do pretty awesome stuff sometimes. 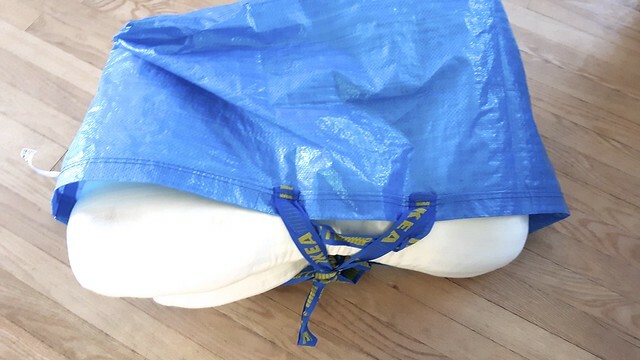 I’ve been moving these old pillows from place to place. They’re not useful to us and they have a weird shape. 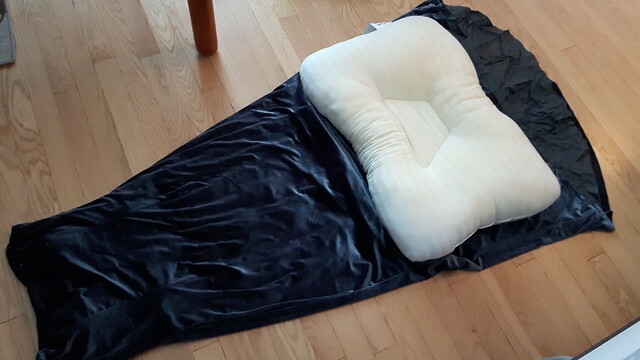 But I thought they’d make nice little floor pillows, and now that LongJohn is spending more time on the floor it’s a good way for those of us with less flexible knees and older backs to join him. 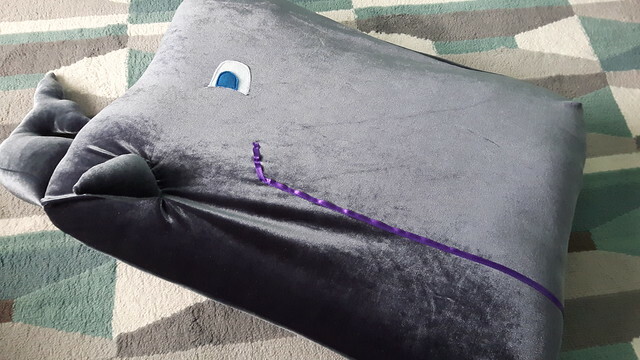 And because everything we make for him tends to be marine-related, I thought I’d make the cushions into sea creatures. What inspired that idea was this dress. This is a bridesmaid dress I wore to a wedding over a decade ago. I hated it then. I hate it now. 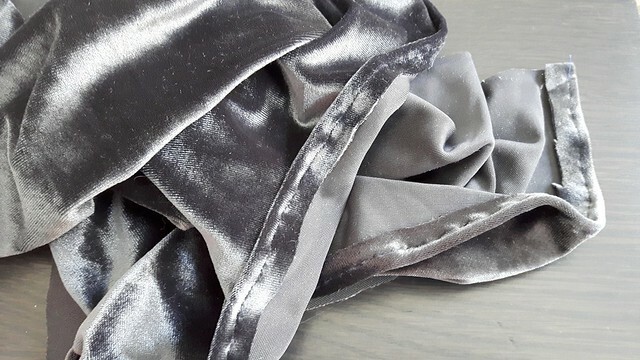 It was really expensive to purchase the fabric and I had to have it professionally made because the pattern was too complicated and the fabric too finicky for my mother and I to deal with. And after it was done I felt like a WHALE in it. So let’s make a whale. 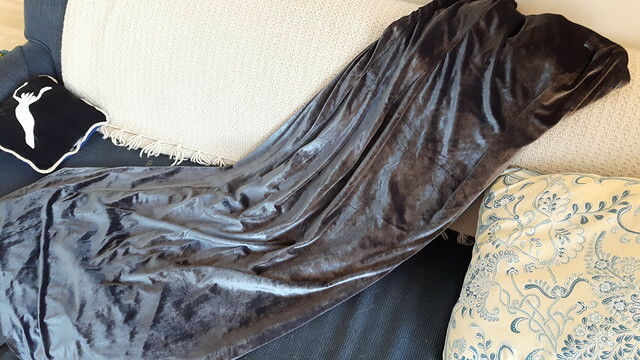 This first cushion turned out wayyyy better than I expected, especially since I totally half-assed everything, didn’t measure a thing, and considering that this stupid stretchy velour crap is THE worst material in the world to work with. It didn’t even PHOTOGRAPH well. Every picture turned out BLURRY. GAH. With LongJohn looking on, I “measured” the pillow to the dress to gauge how much I was going to need to cut off. Cut made! Time to unpick all the stitches. Now I needed to kind of square off the pieces I had removed. See? KIND OF square. 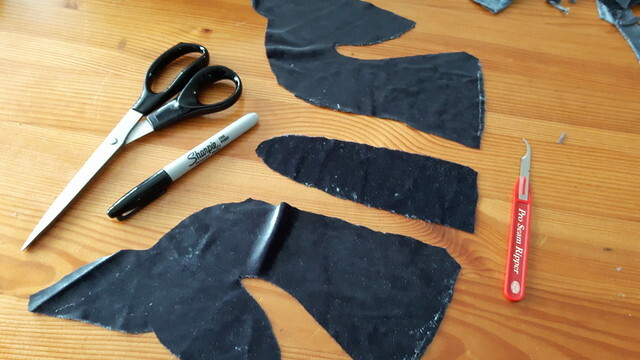 If I wasn’t catering to the patience of a seven-month-old, I would have used my rotary cutter and mat and done a better job. But meh. 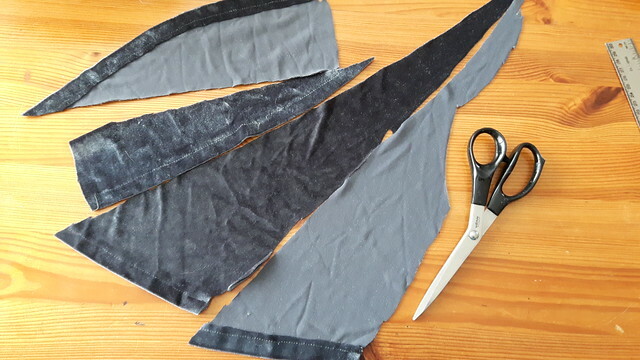 Cutting this stuff left little flecks of gray velour everywhere. Ick. 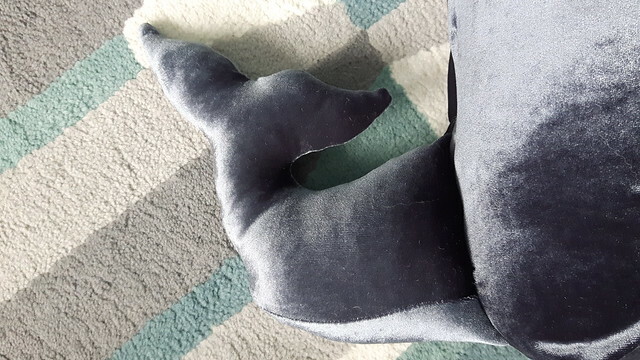 I had some bits here from what I cut off that I thought could make a decent little tail for my whale. 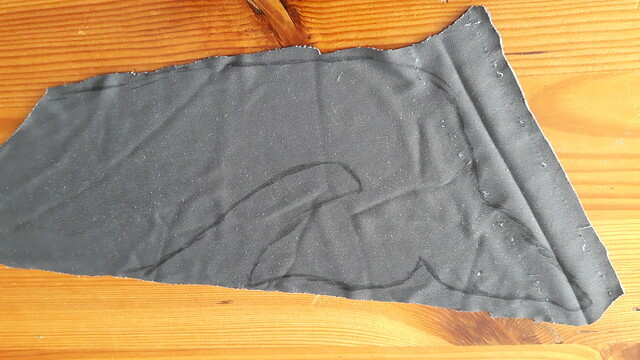 This is not going to be an anatomically correct whale – more the cartoonish sort. I took a Sharpie and drew a basic shape on the back. 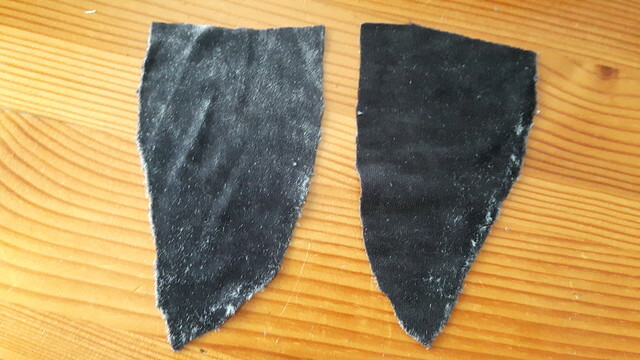 Then tried my best to cut it out of two pieces at the same time. 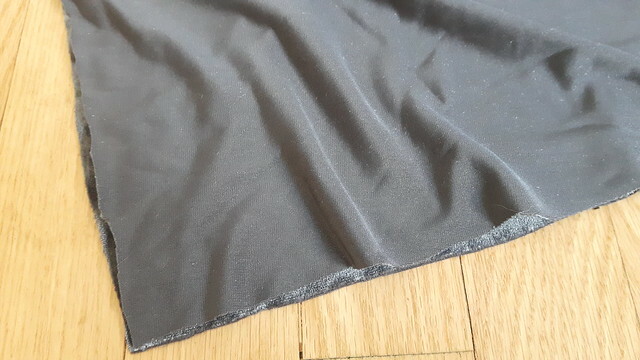 This material is so slidey and stretchy though … The other piece there is for the bottom of the tail, to make it more substantial. 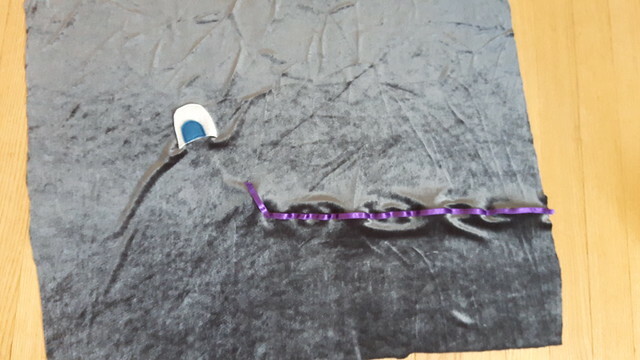 And here is my poor approximation of a cartoon whale’s fin. 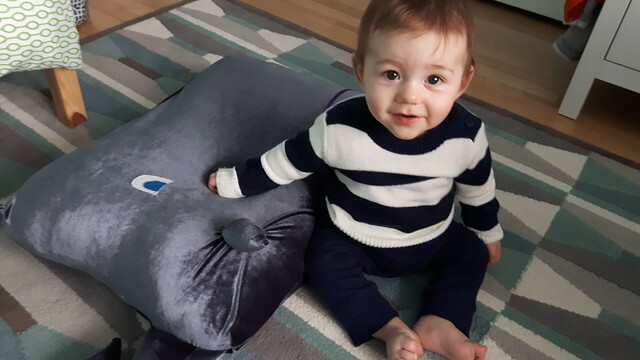 I’m only doing the one fin because this whale is more like a flounder or sunfish and is entirely one-sided. 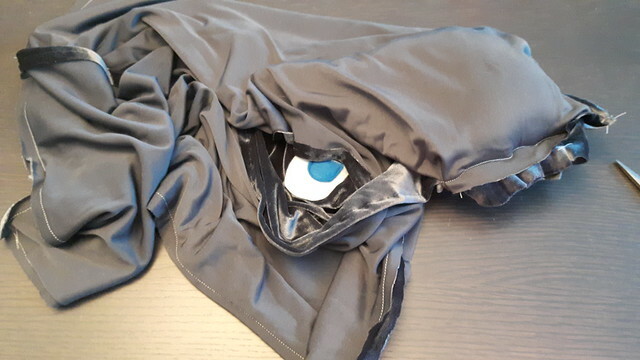 Even pinning these pieces is next to impossible …. Sewing them together and getting the bottom panel in involved much swearing. Good thing LongJohn wasn’t listening. 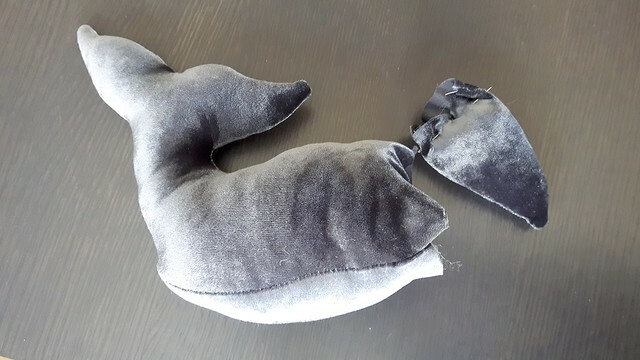 Then I grabbed some polyfill loft (actually I used twice what you see in the picture) and gave the tail and fin a thorough stuffing. They ended up looking way better than I expected them to. 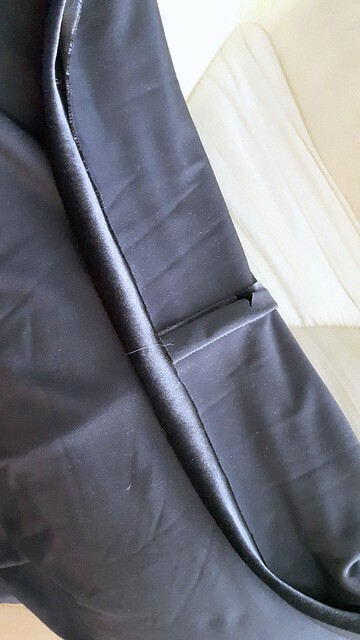 Then I hemmed the two back pieces of the cushion so that I could overlap them and have an opening without having any raw edges. 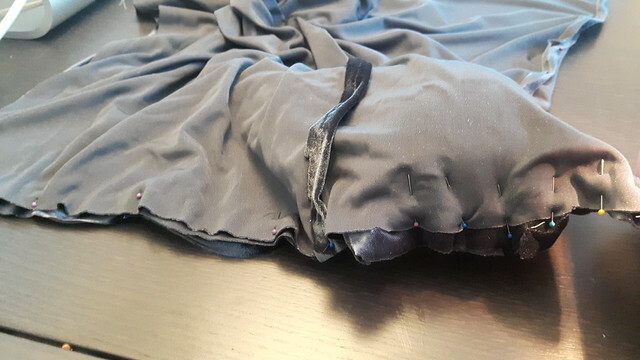 I like to make my cushions so that I don’t have to add snaps or a zipper – just a little overlapping envelope of fabric. I’m lazy. 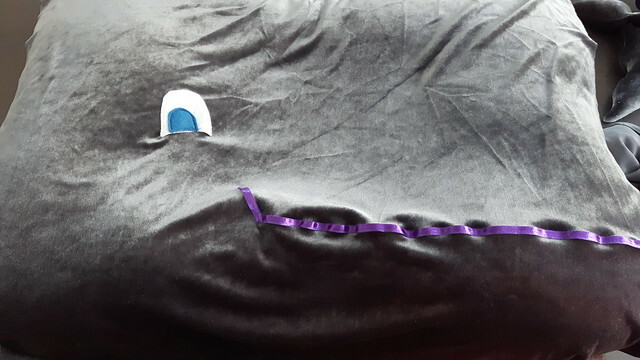 But there’s still the front of the cushion to do, and that cushion needs a face. Here’s my attempt at a face. 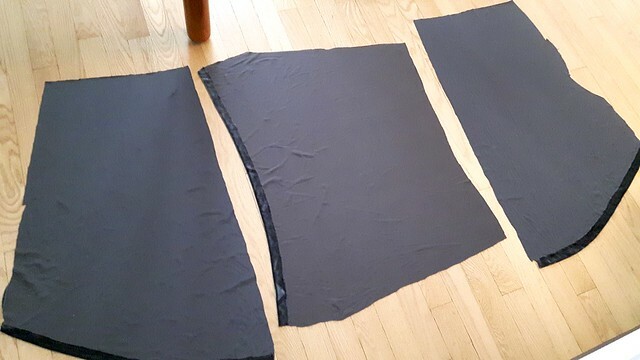 It’s really hard to sew non-stretchy materials to stretchy materials. So it ended up being all wrinkly like this. 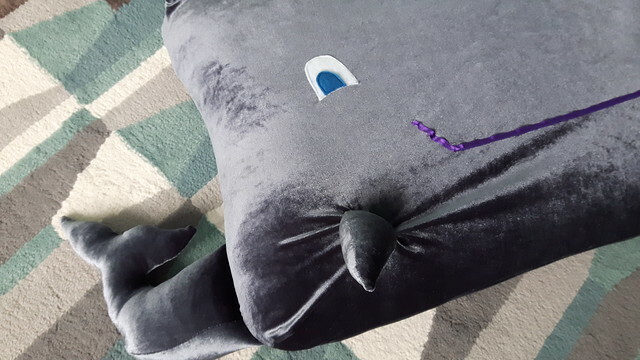 But it looks like a happy whale, right? Now to put the square pieces together. Again, nothing lines up, but it doesn’t matter because everything is so stretchy and impossible. 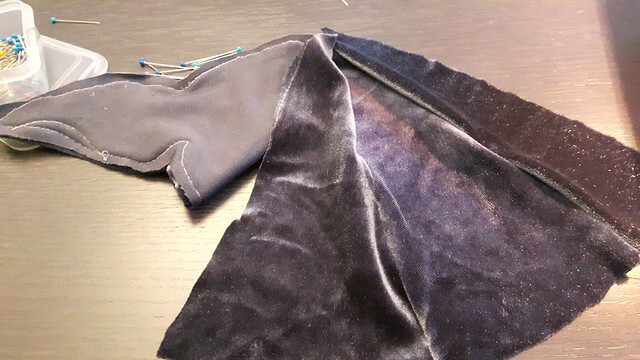 I had to seal in the edges of the tail in order to sew it on without a disaster. And even that was tricky. Here it is all sewn together finally. 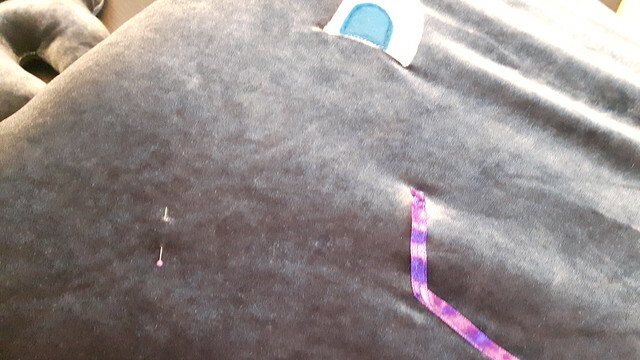 With the cushion in place I put a pin where I wanted the fin to go. 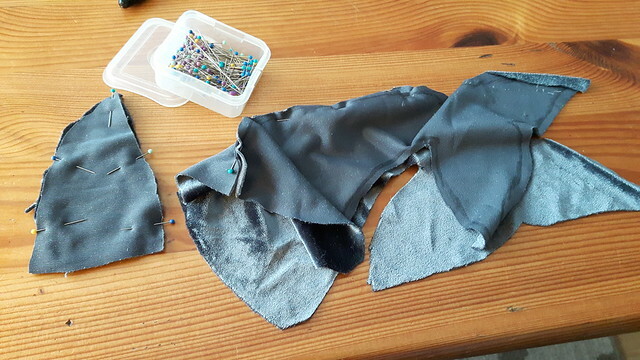 I ended up hand-sewing the fin on because it was impossible any other way. And I also attacked my super pointy corners. 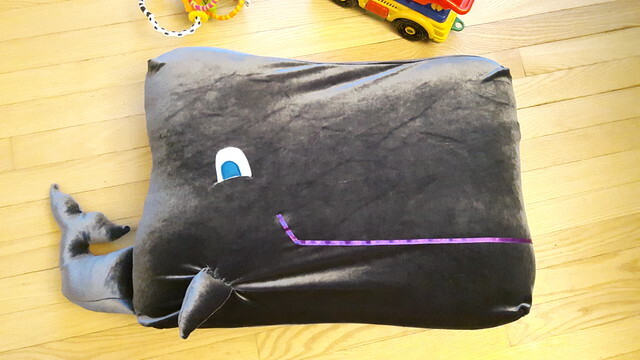 The pillow has rounded edges so I didn’t want those corners to stick out too far – whales are roundish after all. 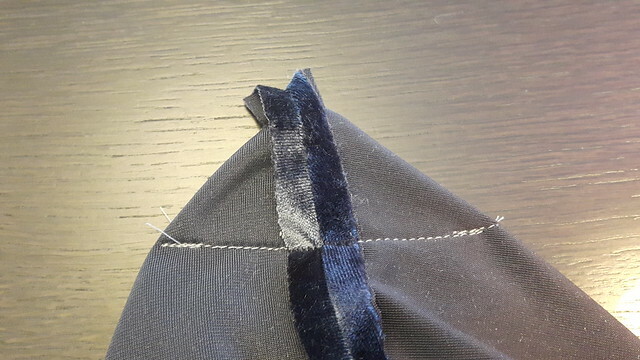 If you were doing this for real you’d be taking the corner of the cushion here (inside out) and flattening it at an angle that the seams you’ve sewn match up, one on top of the other. 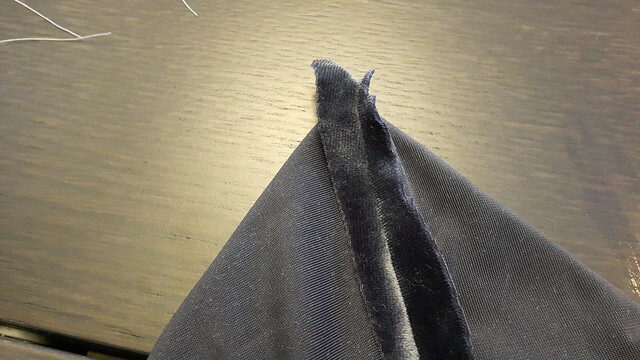 Then you iron it to make a pleat, and you pin it. I did none of those things, save more or less lining up the seams. 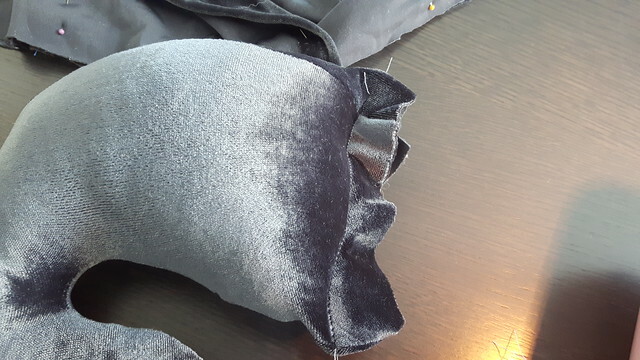 Then you measure the height of your pillow or box (because in the assembly of your pillow you’ve left enough room to account for this) and you sew across the pillow corner to match that height. Again, I eyeballed this. I’m a terrible person. But then when you flip it inside out again, all those pointy corners have disappeared! 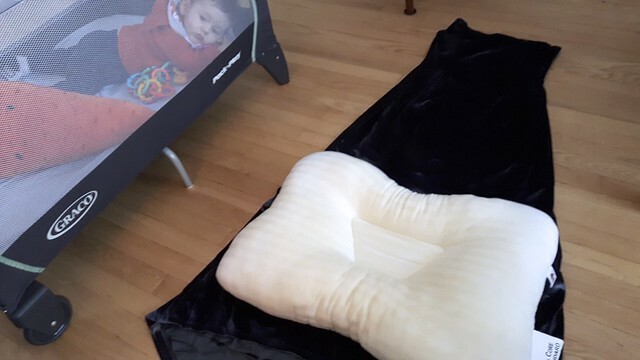 If you have stretchy material and a round cushion, you now have rounded edges. 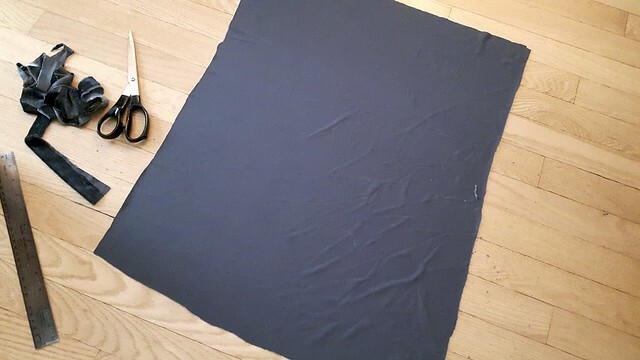 If you have non-stretchy material and a square cushion you now have box edges. Congratulations! Everything turned out with a few gathers and wrinkles but I blame the fabric for that. LongJohn doesn’t care. He just likes to punch it a bunch while yelling. And that’s really all I was going for. The next cushion will be a box fish – wish me luck! Right? It’s not rocket science! Unless of course you’re doing something totally insane.